Sweet Romance Reads: Free Ebook by Lyn Cote--Last Day-March 1st Today! A few decades ago when my husband and I became engaged, he said, “I’d like us to live in the northwoods.” I knew his family owned property on a lake in far northern Wisconsin near the southern shore of Lake Superior. Of course you know where we eventually ended up living---the northwoods in a cottage on that same lake. Here is the winter view from our deck. Our frozen lake lies in the distance. So how did this happen to a nice “southern” girl like me? Well, I fell in love with the beauty of the forest and the many clear, spring-fed lakes. Then life events moved us north. And I must say I wish we’d moved earlier than we did. I’ve made peace with winter, make do with a brief spring, and love the low humidity, warm--no air-conditioning needed--summers and the long golden falls to which tourists flock to capture the beauty with their cameras. I’m a northwoods woman now. And it comes out in my writing. I’ve set many of my books in the northwoods. My “Northern Intrigue” series is set in the forest and lakes around a fictional town, Steadfast WI. The series combines romance and mystery. 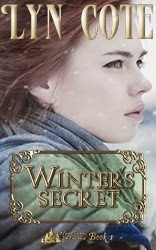 The first book in the series is Winter’s Secret. a town with people and mysteries you may never forget.